This season, Aaron Donald was a one-man wrecking crew on the interior for the Rams. He finished first in the solar system in just about every relevant category for defensive linemen - sacks, pressures, quarterback hits, tackles for loss - everything. Here's the problem - for all of the talent that Los Angeles has on defense surrounding him, Donald is just about the only thing that went right for the Rams' front seven this year. Ndamukong Suh finished with just 4.5 sacks, 4 tackles for loss, and is showing all 31 of his years (in his defense he did pick up 19 QB hits, top-30 in the league). They traded for Dante Fowler halfway through the season - he managed just two sacks and five quarterback hits in eight games. As a team, the Rams finished just 19th in adjusted sack rate, and 29th in yards per rush allowed to running backs (dead last overall). Their defense was propped up by their propensity to force turnovers - 30 overall. There's another problem there, though - the Rams were incredibly lucky recovering fumbles. The Rams defense forced 14 fumbles, and recovered 12 of them. That's just not a sustainable number - a defense will recover roughly half of the fumbles they force over a long enough sample. All of this is to say that Donald needs to have a monster game in order for the Rams to get stops. Drew Brees doesn't exactly throw a lot of interceptions, and they can't count on having a high-80s percent chance of recovering a fumble (if they even force one). If Donald is anything short of a tour-de-force in this game, it suddenly turns into a matchup where the first team to 40 probably wins. To be honest, there isn't really much in this matchup that isn't already on the table. We pretty much know what both of these teams are. Elite offenses with passable defenses. Both teams stayed remarkably healthy all year. Both teams have a clear strength that matches up favorably with a clear weakness for the other team (New Orleans rush offense vs. Los Angeles rush defense; deep corps of LA receivers vs. a New Orleans' secondary that struggles on the outside). As the two best teams in the conference, we've seen and heard and read and discussed just about everything there is to know about these two teams. So, this game might come down to which team pulls a new gadget out of their bag of tricks. Will either of these teams fake a punt, or surprise an onside kick, or unexpectedly switch up a defensive philosophy (playing zone when they've played man-to-man all season, etc.)? When everything is on the board, the game comes down to simply which team executes better and/or presents a wrinkle that isn't already on the board. Both Sean Payton and Sean McVay are innovative coaches who in the past have pulled out a gadget in a big moment. If either one of them tries it this weekend, and their team pulls it off, it could be the difference in the game. A game the Rams led 20-3 at halftime against Dallas last week somehow came down to the wire, but LA flexed its muscles and showed why it was a trendy Super Bowl pick coming into the season. The Rams bludgeoned Dallas on the ground, amassing 273 yards rushing, with journeyman C.J. Anderson leading the way with 123 and two scores, and All-Pro Todd Gurley turning in a solid 115-yard, one touchdown performance in his first game back from injury. The LA defense also bottled up Dallas' vaunted ground game, holding Zeke Elliot to just 47 yards on 20 carries. Basically, the Rams beat the Cowboys at their own game. Now, with Jared Goff protecting the ball, the physical Ram front stuffing the run, and a pair of beastly backs leading the charge, LA is playing championship football, but will it be enough in the Dome? After falling in a 14-point hole early, the Saints bounced back against the upset-minded Eagles and completely dominated the game's final three quarters. That said, it was still close, and even NO's close to 38 minutes of possession time couldn't put the Eagles away until the very end. Still, it's hard to look past how well New Orleans' defense played, pitching a shutout for three quarters, and how balanced and unpredictable the Saints' offense was. Last week seems to be little more than a team coming off a bye against a hot opponent, but could the slow start be cause for concern against the explosive Rams? If I were a betting man, I would bet on the Saints, and I'd bet on the under (the total currently sits between 56 and 57, depending on where you look). I expect this game to actually be relatively low-scoring, simply because both teams are such proficient rushing offenses, and I'd imagine we'll see some long, 10-12 play, 7-8 minute drives. When these two teams met at the beginning of November, the Saints jumped out to an early lead, which forced Los Angeles into an air-it-out offense, rendering Todd Gurley a relative non-factor. That's the way to beat the Rams. When they get their ground game going, they're just too balanced and efficient for anyone short of an elite defense to stop them. The best way to slow down the Rams' offense is to keep them off the field and get out ahead of them. Granted, that's also the best way to slow down New Orleans' offense as well. Unfortunately for the Rams, the Saints have one of the league's best run defenses - it seems unlikely to me that the Rams will be able to get their ground game going early, which also makes it seem unlikely to me that the Rams will be the ones to jump out to an early lead. With offenses this good and defenses that aren't quite as good, the upper hand goes to one unknown (the team that happens to end up with the ball last) and one known (the team that can salt away a late lead with their running game). The Saints just fit that bill better than the Rams do. Well, I've been saying Saints vs Patriots all year, so I may as well stick to my guns (spoiler for my AFC pick). While LA's performance last week gives me pause, and showed that the Rams also have a pair of capable backs, I have to go with the experienced team that won earlier this year. Drew Brees has the best running game of his career, a true No. 1 receiver, and a solid defense. Those things haven't come together very often for him, and I think he cashes in on it for his second trip to Super Sunday. The first time these two teams met, the game was decided by who had the ball last. There was one punt in the game - every other possession was a score or a turnover. Defense was optional. Of Kansas City's 446 yards of total offense, 327 of them were gained by just two players - Tyreek Hill and Kareem Hunt. Obviously, Hunt is no longer in the picture, but Hill continues to be a dynamic player. Gilmore was one of the best cornerbacks in football this season. Whether or not he'll end up opposite Hill is another question. A common defensive strategy for the Patriots over the last handful of years has been to line up their best cover cornerback (Darrelle Revis, Malcolm Butler, now Gilmore) actually opposite the opponent's No. 2 receiver, then putting their secondary cornerback on the other team's best receiving threat, and then rotating their safeties over the top. That way your best corner has an advantageous matchup against a lesser receiver, and the opponent's best receiver is seeing double-coverage all afternoon. Here, though, Kansas City's secondary receivers aren't quite as threatening. Travis Kelce is certainly dangerous, but I doubt the Patriots would put Gilmore on Kelce unless he's lined up wide. I would expect Gilmore to mirror Hill, trying to prevent Hill from having the kind of game he did back in October. This matchup is purely strength versus strength, so whichever player ends up with the upper hand will be going a long way towards winning the game for their team. The Patriots averaged between eight and nine plays per scoring drive, while the Chiefs averaged between five and six. The Patriots were grinding out long drives, while the Chiefs needed two different touchdown plays of 60+ yards to keep up. Yes, Kansas City's offense generated a ton of big plays this season, but two long touchdowns like that aren't exactly something you can count on every game. The Patriots really had no trouble marching up and down the field against the Kansas City defense - they didn't punt all game; they converted 31 first downs and held the ball for 36 minutes of game clock. They lost a fumble, they had a turnover on downs, and other than that every single possession was a long scoring drive. If you're looking for a harbinger, something that happened last time that might repeat this time, I certainly have a lot more faith in a team being able to grind out more long touchdown drives rather than a team being able to pull a few long touchdowns out of their hat. It's January, so the Patriots are probably still playing football. Yeah, this is New England's eighth consecutive AFC Championship Game appearance, which is just patently absurd, seeing as only three other AFC teams (Pittsburgh, Denver and Oakland) have made more than eight conference title game appearances in their entire history. The Brady/Belichick duo is making its 13th appearance on championship Sunday, so experience will be decidedly on one sideline. Also working in New England's favor could be the weather, because the Patriots are not especially equipped to win a high-flying shootout against the Chiefs (what with Josh Gordon being gone and Rob Gronkowski aging exponentially), but they would seem to very well-stocked to win a slugfest. The Patriots gave us a preview of what that might look like last week, when they turned Sony Michel loose, to the tune of 24 carries for 129 yards and three scores. That opened things up for a very sharp Brady and, though his weapons might seem limited, Julian Edelman is still every bit the big-game player he's always been, and James White continues to be the most underrated pass catching back I've ever seen. After a blowout win last week, are Brady and Co. ready to make another Super Bowl run? Probably. Tough to find many flaws with the way the Chiefs played at home against a hot opponent last week, icing the Colts in a 31-13 win. But, there could be cause for concern. In the wintery conditions, star quarterback Patrick Mahomes looked human, throwing for zero touchdowns and under 300 yards for the first time all season. All that on 41 attempt through the air, and the young All-Pro took four sacks, while throwing some flat-out ducks. Of course, Mahomes still didn't turn the ball over, managed several long drives, and running back Damien Williams was fantastic. Plus, the Chief defense played one of its best games, stifling a previously hot Colts offense. Was this the product of bad weather causing both offenses to be out of sync? Maybe, but does that bode well for the Chiefs as they welcome a better opponent in potentially worse conditions? 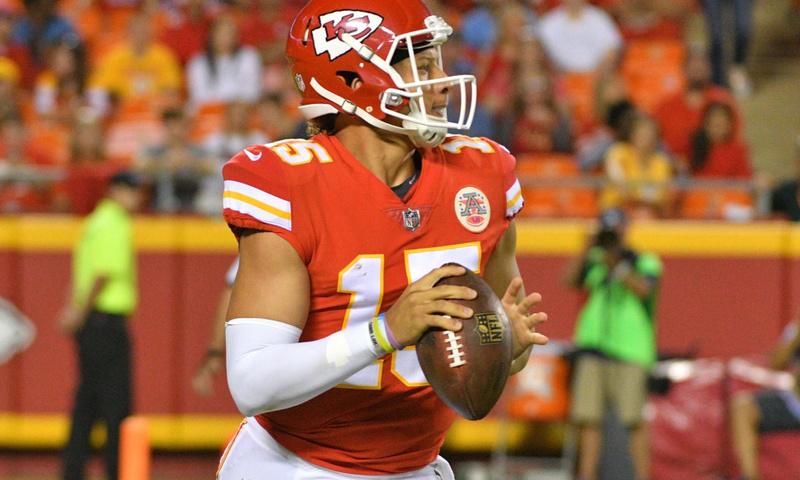 If KC learned from last week, it could be an advantage, especially if Mahomes is sharper in his second ever playoff start. I know the Patriots are 3-5 on the road this year. I know the Patriots don't have the best track record winning on the road in the playoffs. I know I picked against the Chiefs last week and they made me look stupid. I'm fully aware I'm making this pick with my heart and not my head. I think there are signs that point to the Patriots being able to sneak out of Kansas City with a win. Bad weather this weekend certainly favors the team that doesn't rely on big plays to score. The New England rushing offense has developed into a legitimate weapon over the last few months. The Chiefs have a porous defense, especially against the run. Bill Belichick has an astounding record against rookie quarterbacks. The Patriots won the matchup earlier this year. Andy Reid is the coach of the Chiefs. Sure, there are signs that point to the Chiefs also. The Chiefs are at home and the Patriots were dismal on the road. The Kansas City offense hasn't really missed a beat without Kareem Hunt. The Patriots don't have a great option for covering Travis Kelce. The Chiefs' defense stepped up big time against the Colts last week. Tom Brady hasn't really looked quite like Tom Brady pretty much all season. I know I said earlier that I kinda had to make this pick to keep my old Super Bowl prediction, but I honestly feel like this is how the game plays out. New England went old-school on the Chargers last week, suffocating the Bolts' offense, and beating their defense up with a healthy dosage of Sony Michel and Co. on the ground. Since the forecast calls for the 8th season of Game of Thrones in Kansas City Sunday, I'll go with the team that has shown it can win by running the ball and playing defense against a good opponent.